Kingstown, Saint Vincent and the Grenadines -- (ReleaseWire) -- 03/11/2015 --https://www.octafx.com/pics/a/new-contests-big.png Good news for all OctaFX traders - the company have upgraded all demo contests to have cutting-edge features of Supercharge real contest! Already got the taste of meaningful competition? OctaFX brings that feature to all demo contests! 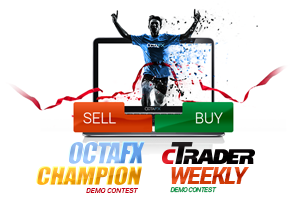 "We are impatient to draw your attention to our newly redesigned contests - both OctaFX Champion and cTrader Weekly demo contests received new looks!" - OctaFX Representative. However, looks are not the only thing that's changed. From now on a trader can avaluate all the features of innovative contest platform trading on demo accounts! One can receive achievements, review other traders' profiles and leave comments to interact with fellow traders! Feel free to join OctaFX Champion demo contest: round 37 starts in 11 days on March 16! Registration for cTrader Weekly is open for round 12 - the new round starts on March 16!